The Bills have their quarterback of the future in EJ Manuel, who was selected on day one with the 16th overall pick. But with just three quarterbacks off the board through the first two days the quarterbacks left on the board suddenly present good value. The Bills still have some positional needs, but come the fifth or sixth round might it make sense to stock away a second QB prospect? Here are some of the more notable quarterbacks still on the board as we get set for Day 3 of the NFL Draft, including some that made pre-draft visits to Buffalo or had private workouts with the Bills. I’d expect the Bills to address some pressing positional needs like CB, TE or S first before considering another signal caller. Other NFL teams have parlayed extra young quarterbacks on their roster into future draft choices, most notably the Philadelphia Eagles. The NFL draft is less than a month away so keep the questions coming at AskChris@bills.nfl.net and on Twitter @ChrisBrownBills. Here’s the latest edition for you loyal Bills fans. One guy that seemed to stick out to me while watching the combine is Mark Harrison. Wondering what your thoughts are on him and where he is projected to go round wise. Thanks for all you do! CB: Harrison is a great physical talent at 6’3” and 231 pounds. The fact that he runs a 4.37 40 will get him a look from teams, especially after bouncing back from a down junior year. His numbers this past season still weren’t quite as good as his sophomore season when there was a lot more receiving talent around him. Harrison is probably a day 3 pick based on his physical skills alone even though his hands looked more reliable in 2012 than in 2011. With all of these needs in mind and only 6 draft picks, do see the Bills being competitive in 2013? CB: I don’t disagree that there are several holes to still fill. At the same time the quality of the talent on this roster is pretty good (think – D-line, safety, OT). Part of that is due to the people they chose to part ways with (Donald Jones, David Nelson) and older players that either retired or will not be retained for the future. You’re right with six picks Buffalo has to do some plugging in free agency. I think they’ll do a bit more work in free agency prior to the draft and then post-draft they’ll see where some positional needs still lie and plug in some bargain free agents presumably on one and two-year contracts. With the Bills having only 6 picks in this year’s NFL draft, and players who fit like Tyler Wilson, Ryan Nassib and Manti Teo most likely being available in the late 1st or early 2nd round, do you think that they might trade back in the 1st round with their #8 pick to gain extra draft picks? That would seem to make sense – if Buddy Nix is willing. CB: I think trading down is a realistic possibility only if their top graded quarterback is off the board. Bills GM Buddy Nix would like to have more than six picks. Moving down from eight is the only way to do that, but landing a quarterback of the future likely trumps everything. Just wondering, what’s up with Marcel Dareus? I understand that he plays through pain, both physical and emotional (considering his brother’s death), however I just can’t help but think that he has not lived up to expectations as a number three overall pick. Considering the bevy of talent that was available that year, it really baffles me that he isn’t living up to his draft spot or to his draft class. Your thoughts? CB: I think last year was a lost year for Dareus. He lost his brother after the first regular season game in a tragic act of violence. His brother was just 19. Even though Dareus lost his dad when he was 6, his grandmother at age 13, his high school coach at age 18, his mom at age 20 and his best friend from high school at 21, this latest loss may have topped them all. All that loss and just 23-years of age, I’m willing to give him a pass for the 2012 season. I just don’t think his head was in the game and how could it be? Anyone that has to experience all that is probably wondering what he did to deserve all that hardship. Hopefully he can come back and re-focus under a new staff and be the upbeat guy he has always been despite a very difficult hand that’s been dealt to him concerning his family. Do you worry about Dion Jordan being another Aaron Maybin? Also it’s great the Bills front office is upfront with fans about needing a quarterback but not at the expense of other teams knowing and using that against us. How do you see Mike Pettine’s defense set up with our personnel? Can we run a 3 -4? We have a lot of D lineman. CB: I understand the concern. Seeing him at the NFL Combine, he looks like a swingman for a basketball team. The difference is Jordan has more of a college resume than Maybin, who had one-year of starting experience and came out as a redshirt sophomore. Jordan’s body is more mature, though he is coming of a torn labrum in his shoulder. I also think the one thing Jordan has that Maybin did not was instinct. Maybin was a hard worker, but did not seem to have the football acumen to anticipate and diagnose plays. The word on Jordan is that he does, which is why he’s seen as a top 10 pick. Pro days are underway and free agency is up next. Here’s the latest edition of your questions from AskChris@bills.nfl.net and Twitter @ChrisBrownBills. Many so-called experts are calling for a new middle linebacker to replace Kelvin Sheppard. He seems to be an NFL talent. If a new MLB is brought in, do you see Sheppard playing the weak side linebacker position or a second inside linebacker position if the Bills are in a 3-4 defense? Thanks. CB: I would anticipate Sheppard to be a primary candidate to be one of the two inside backers in any 3-4 looks the Bills defense figures to employ. As for how things work in any 4-3 looks remains to be seen. I’m not sure Sheppard would stay on the field in nickel situations. He didn’t last year when it was Nick Barnett and Bryan Scott serving as the nickel LBs. Linebackers with coverage ability are more coveted than ever in a league that leans more and more to the passing game. Buffalo will be looking for more of them both inside and outside at linebacker. CB: Young is too much of a personality headache. For a new head coach trying to establish a program and approach to success, Doug Marrone doesn’t need a problem player like Young no matter how talented he is. Marrone and his staff are going to be presented enough challenges as a first-year staff, they don’t need to add to the pile with a player that bought himself a ticket off the Lions roster by being a horrible teammate. Is Glennon or Wilson worth the 8th pick or do you see them taking a much needed LB and maybe one of the Top 5 QBs in the draft might be there in round two. Or do the Bills use the first 3 rounds to better the Defense and get a QB in free agency? CB: I think it’s safe to say that the pickings are slim in free agency at QB so either their first or second round pick will need to address quarterback. I don’t see Glennon or Wilson as a top 10 pick, but I’m no scout. I believe both will be heavier considerations in round 2 or 3. I think if there’s a QB the Bills like at 8 they’ll take one, otherwise they’ll take the best defensive player available. If there isn’t a top defensive talent they believe is fitting of the eighth pick and the QB they like is gone I think they look to move back. Improving the defense will be a focus, but I think they might try to reduce those needs in free agency to reduce the to-do list in the draft knowing they have just six picks. I would like your perspective if Buddy should draft a WR or LB with the first pick and then trade back into the late Rd 1 to get a QB still on the board before teams like ARI, KC, PHI, NYJ can grab one. Also assuming that there might even be a possibility that R. Nassib could still be there.? Nix did say that what the Bengals did to get A.J Green and Dalton changed their franchise… Mainly would he be willing to trade back into Rd 1? Secondly, I think we need to lock up C.J. Spiller before he hits free agency and so we don’t have to use a franchise tag. Couldn’t the Bills be doing that already this offseason? Why do we need to wait another year when he is only going to get better and we are going to have to pay him more? CB: I’m a little reluctant to take a WR in round one at 8, primarily because I think there are only a couple of first round worthy receivers in the entire draft, and one of them is a risk in Patterson due to a lack of a college resume (one year of production). If you’re picking a receiver eighth overall he should be able to help right away. I’m not sure Patterson is an immediate impact guy, which is what Buffalo needs. Second, wide receiver has the highest miss rate in terms of position in round one. That according to ESPN NFL analyst Bill Polian who has done studies on it. Buddy Nix only has a short draft history here in Buffalo, but he likes to let the draft board come to him rather than seek out trades and be active in moving up and down the board. However, this year I think one of two things could happen. The Bills either move down from 8 (as I stated above) if a QB they like or a defensive player fitting of value at eight isn’t there anymore or they try to move into the bottom of round one from round two. As for Nassib I think he’s going to be a late riser and find his way into the bottom of round one. Finally Spiller still has two years left on his rookie deal. They can wait until this time next year to address an extension. What is the bigger need inside or outside LB? How will the positions be used in the new hybrid system? Could prospects like Te’o and Ogletree play inside or outside? CB: I’d tend to think the two spots are equally in need of additional talent. Sheppard is capable of playing one of the inside linebacker spots in a 3-4 front. Nigel Bradham is one of the few viable OLB candidates on the roster. I think we’ve got to wait and see what defensive coordinator Mike Pettine has in mind with respect to the multiple scheme he plans to employ. Te’o is strictly an inside linebacker. Ogletree is capable of playing both inside and outside. Arkansas QB Tyler Wilson spent some quality face time with Bills scouts and coaches four weeks ago at the Senior Bowl in Mobile. And he was back in the meeting room with the Bills last night, at the NFL Scouting Combine. Wilson said he had a good meeting with the Bills Thursday night in Indianapolis. Wilson struggled through a tough Senior year at Arkansas, when his head coach was fired and several of his favorite targets left for the NFL. But he said today he has no regrets about returning for his final year with the Razorbacks. The entire interview with Arkansas QB Tyler Wilson can be heard tonight when The John Murphy Show broadcasts live from the NFL Scouting Combine. The show airs from 7-9pm on the flagship station of the Bills, WGR Sports Radio 550. NFL Network draft analyst Mike Mayock was asked what quarterbacks in this year’s draft pool fit the West Coast system the best. Knowing Buffalo offensive coordinator Nathaniel Hackett’s offense is rooted in a lot of West Coast principles, it’s an answer I thought would be worth passing along. “I think Matt Barkley makes a lot of sense,” said Mayock. “He’s a guy as a junior at USC looked so much different than he did this year. I think to be fair to him you have to go back and watch junior tape. Seeing Nassib mentioned is no surprise knowing he ran a version of the West Coast under Hackett at Syracuse. Here’s the rundown of the 16 quarterbacks in the 2013 NFL draft pool that have been invited to the NFL Combine. Among the invitees at the quarterback position, only one is a junior eligible. Bray, Cameron and Vandenburg have been chosen to be the “throwing quarterbacks” who will participate during the receiver gauntlet drills among others. Bray’s inclusion is a bit surprising, knowing those duties are reserved for lower round prospects. 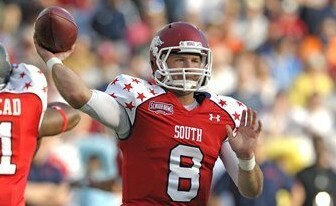 Featured today on Buffalobills.com is Syracuse QB Ryan Nassib, part of this year’s quarterback draft pool. Nassib has been widely ranked as one of the top five signal callers in this year’s draft class, but NFL draft analyst Russ Lande took Nassib’s stock and put it at the top of his rankings list. Lande, a former NFL scout for the Rams and Browns, listed Nassib not only as his top QB prospect, but his top prospect overall. Lande simply lists his top 200 prospects in this year’s draft class, without any reasons why certain prospects garnered so much respect from him. Nassib has not even been ranked as the top QB prospect by all the other draft prognosticators, let alone the top prospect overall, though some do believe that he has the chance to move up boards late in the pre-draft process with a good showing at the NFL Combine and in pro day workouts. In terms of some of the other quarterback prospects and where they ranked on Lande’s list, he had Tyler Wilson 33rd overall, Matt Barkley 37th, Mike Glennon 43rd and Geno Smith 44th. CBSSports.com has put together a mock draft, and surprise, surprise, they’ve got the eighth pick of the Bills being used on a quarterback. CBSSports.com’s draft analyst Rob Rang picks Arkansas’ Tyler Wilson for the Bills at eighth overall. Here’s his reasoning as to why. Tyler Wilson, QB, Arkansas: While incumbent starting quarterback Ryan Fitzpatrick is far from the team’s weakest link, few believe he is the caliber of quarterback that can lead Buffalo to a Super Bowl. Furthermore, general manager Buddy Nix has specifically stated he hopes to find the team’s quarterback of the future. Furthermore, he told reporters at the Senior Bowl that he was impressed with Wilson’s arm strength. While new head coach Doug Marrone might prefer his former Syracuse signal-caller Ryan Nassib, Wilson has the production against SEC competition to make Marrone – and the rest of Buffalo — believers. The mock has two quarterbacks coming off the board prior to Buffalo’s pick at 8. Rang has the Chiefs taking West Virginia QB Geno Smith with the first pick, and Arizona taking USC QB Matt Barkley with the seventh pick right in front of Buffalo. QB Tyler Wilson = Kirk Cousins? The practices for Saturday’s Senior Bowl are winding down–four practices for each of the teams in total this week. And observers who’ve been watching the quarterbacks work are drawing their own conclusions about how they stack up. Former DB Charles Davis is an analyst for the NFL Network who’s part of their “Path to the Draft” coverage. He’s been here in Mobile, Alabama all week long watching the quarterbacks work out. The consensus among the media seems to be that Arkansas QB Tyler Wilson has been the steadiest of the six QB performers this week. And Davis agrees. ‘“He has all of the intangibles and in a lot of ways he reminds me of Kirk Cousins from last year,” Davis told The John Murphy Show at the Senior Bowl. Davis says Wilson persevered through a rough senior year at Arkansas and is better for it. The time for hype is here, when it comes to the prospects in the 2013 NFL Draft. More than 100 draft eligible players have assembled here in Mobile, Alabama for the Senior Bowl. And with the Buffalo Bills fans focused on the quarterback spot, one bit of hype hits home. ESPN Draft Guru Mel Kiper made waves last week, when he compared Arkansas QB Tyler Wilson to Bills Hall of Famer Jim Kelly. We had a chance to talk with Wilson today at the Senior Bowl, and asked him about Kiper’s comparison. Wilson will appear on Monday’s podcast of The John Murphy Show from the Senior Bowl in Mobile. And the Razorback quarterback takes pride in his toughness, playing through multiple hits to the head during his senior season. Wilson earned high marks for assuming a leadership role with Arkansas in his senior season, after Head Coach Bobby Petrino was dismissed last April. The quarterback said he took it upon himself to fill the void when his team’s Head Coach was suddenly fired–he considered it his duty. Arkansas QB Tyler Wilson lost his three top receivers following the 2011 season, but still put together a pretty respectable 2012 season. That fact wasn’t lost on ESPN NFL draft analyst Mel Kiper when asked for a thumbnail sketch on the Razorbacks signal caller. Wilson is participating at the Senior Bowl this week, and Kiper gave his assessment on where he might come off the board. He also feels that Wilson is comparable to Jim Kelly in one key area. “Tyler Wilson going into the year you thought could be a first round pick, and now more of a second or third rounder,” said Kiper. “A kid that can throw the football. Tough, a guy that looks down that gun barrel and makes a lot of throws. When the pressure is on him he showed he is tough and would hang in there and make some nice, accurate throws. As tough as they come. Has the toughness of a linebacker. “We all remember Jim Kelly when he came out of Miami he was recruited as a linebacker at Penn State. It’s a guy with an NFL arm and tremendous toughness. Under the previous coaching staff and with the talent around him, remember they lost their top three receivers from the prior year you expected this year to be a tough go and then he had an injury early on. Wilson completed better than 62% of his passes, threw for over 3,300 yards with 21 TDs and 13 INTs. He was sacked 14 times.